I love the power books have to transport me into people and places. And as I read "On Little Wings", the words moved me to a place I've never been, but yet totally familiar to me. In this book, I dwelt in the hearts and minds of the people of Smithport, Maine, and the stranger among them, Jennifer. Only she's not a stranger: her mother has told the sixteen year old that she has no family, but when she by accident finds a old photo of a woman who looks like Jennifer, but is NOT Jennifer, her whole life as she knew it explodes. This was a real book. And by real, I mean the characters lived and breathed, and now occupy a home in me. And Smithport is as much a character as the quirky but well rounded people who live there when Jennifer, against her mother's wishes, goes to visit. I would tell you what happens when she gets there, but then that would ruin the beautiful pacing of this book. The book begins with the revealing of her mother's secret, and as Jennifer continues to spend time in Smithport, she discovers that everyone has secrets, even herself, that take time and trust to reveal as everyone learns to spread their wings and soar, if only for a moment. This was a lovely book, one that will remain with me for a while. My only quibble, and it's a small one, is that I had wished that there had been more of her interactions with her mother before the discovery of the photo. It made the character of her mother less sympathetic, and I wanted to love her as much as everyone else apparently did. 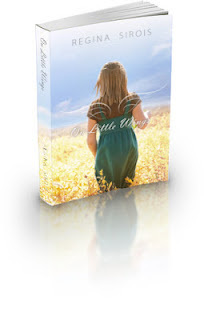 "On Little Wings" is available at Amazon, both in Kindle and paperback. Go check it out...it's just an amazing journey. Thank you so much for your review. I am thrilled that the people and places became real for you. And just so you know how spot on you are- my agent asked me to write two more conversations with Jennifer's mother, just to help people relate to her more. So feel good about your powers of perception that your intuition lined up with seasoned professionals in the printing world! Way to go. Halfway through it now and loving it. Her writing is beautiful.